When you think of salmon, what comes to mind? Blackened? Grilled on a plank? This recipe for BBQ Wild Alaska Salmon Flatbread from Wild Alaska Seafood is pretty darn simple — especially if you plan ahead and have some cooked, crumbled bacon and caramelized onions prepped and ready to sprinkle on top — and it’s loaded with those sweet, sweet omega-3 fatty acids. Plus, you know, it’s delish! Prepare caramelized onions and bacon if not already done. Place flatbreads onto baking sheet(s). Spread barbecue sauce onto breads; sprinkle cheeses evenly over sauce. 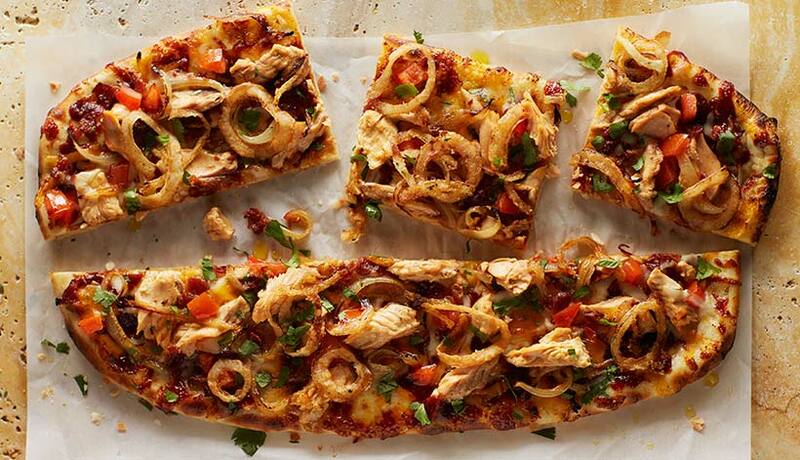 Top flatbreads with drained salmon, caramelized onions, crumbled bacon and diced tomato. Bake for 5 to 7 minutes, until cheese bubbles. Remove from oven; sprinkle with cilantro and crispy onions. What a very nice idea! A salmon into a pizza! I bet this is so delicious! Thank you for sharing this! Can’t wait to try it! These flatbread look absolutely delicious! I will be shopping for the ingredients today and make these tomorrow for lunch. Thank you for sharing your wonderful looking recipe! Thanks for sharing! I think I will have this for dinner together with my kefir drink.